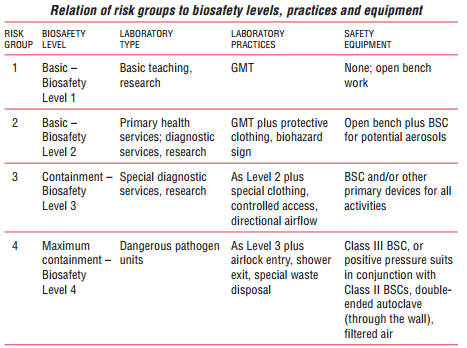 Biosafety level designations are based on a composite of the design features, construction, containment facilities, equipment, practices and operational procedures required for working with agents from the various risk groups. 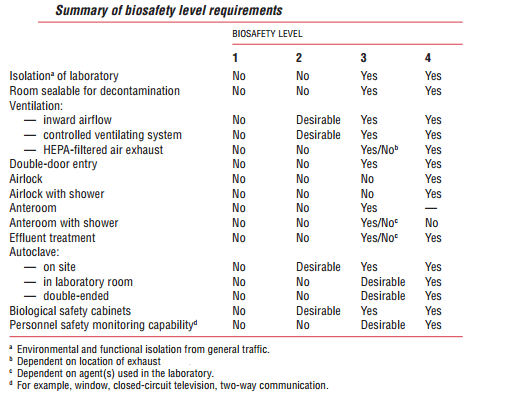 maximum containment – Biosafety Level 4. Standard, open bench, no special facilities needed; typical of most microbiology teaching labs; access may be restricted. Low infection hazard; microbes not generally considered pathogens and will not colonize the bodies of healthy persons; Micrococcus luteus, Bacillus megaterium, Lactobacillus, Saccharomyces. At least level 1 facility and practices; plus personnel must be trained in handling pathogens; lab coats and gloves required; safety cabinets may be needed; biohazard signs posted; access restricted. 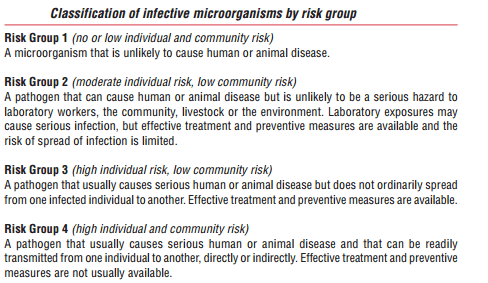 Agents with moderate potential to infect; class 2 pathogens can cause disease in healthy people but can be contained with proper facilities; most pathogens belong to class 2; includes Staphylococcus aureus, Escherichia coli, Salmonella spp., Corynebacterium diphtheriae; pathogenic helminths; hepatitis A, B, and rabies viruses; Cryptococcus and Blastomyces. Minimum of level 2 facilities and practices; plus all manipulation performed in safety cabinets; lab designed with special containment features (Air lock, Negative air pressure); only personnel with special clothing (Body fully covered) can enter; no unsterilized materials can leave the lab; personnel warned, monitored, and vaccinated against infection dangers. Agents can cause severe or lethal disease especially when inhaled; class 3 microbes include Mycobacterium tuberculosis, Francisella tularensis, Yersinia pestis, Brucella spp., Coxiella burnetii, Coccidioides immitis, and yellow fever, WEE, and HIV. Minimum of level 3 facilities and practices; plus facilities must be isolated with very controlled access (Increased Surveillance, Entry Security such as Proximity Key card, Retinal Scan) ; clothing changes and showers (chemical showers) required for all eligible people entering and leaving; Completely sealed doors, Rooms with Negative Pressure; materials must be autoclaved or fumigated prior to entering and leaving lab. Agents are highly virulent microbes that pose extreme risk for morbidity and mortality when inhaled in droplet or aerosol form; most are exotic flaviviruses; arenaviruses, including Lassa fever virus; or filoviruses, including Ebola and Marburg viruses.